Obesity and type 2 diabetes are two of the most common potentially life-threatening diseases among men and women in the developed and developing countries of the world. Both diseases share common factors in the risk and prognosis of breast and prostate cancers. Adiposity, together with type 2 diabetes, promotes an aggressive and metastatic phenotype via endocrine and paracrine mechanisms of action by increasing the expression patterns of hormones and adipokines that are proposed to drive tumor grown. Understanding how the expansion of white adipose tissue, in addition to diabetes, alters the tumor microenvironment could provide links between obesity, metabolic diseases, and cancer progression. 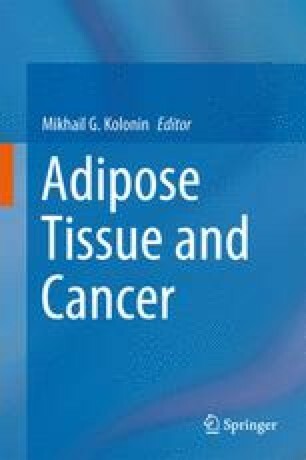 The purpose of this chapter is to examine the complex relationships between obesity and type 2 diabetes, and cancers of the breast and prostate, focusing on the biological mechanisms involved, and explaining how adipose tissue acts as a local source of steroid hormones, growth factors, and adipokines, which stimulate the growth cancer cells. Furthermore, the diametrically opposed effects of obesity, insulin resistance, and type 2 diabetes on premenopausal and postmenopausal carcinoma of the breast are discussed, as well as their potential influence on the development of the metastatic phenotype in both breast and prostate cancers. De Nunzio C, Albisinni S, Freedland SJ, Miano L, Cindolo L, Finazzi AE, et al. Abdominal obesity as risk factor for prostate cancer diagnosis and high grade disease: a prospective multicenter Italian cohort study. Urol Oncol. 2011. http://dx.doi.org/10.1016/j.urolonc.2011.08.007.